Our Instructor Johanna Schwarzbeck is preparing to leave New York at the end of November and plans to relocate in Berlin, Germany, in order to be closer to her family. Johanna is a dedicated teacher and has been active teaching in New York and Upstate for several years, and we are sorry to see her go. Johanna will help to re-introduce Ohashiatsu in Germany with courses and a private practice. We know she is very committed and determined to succeed and we wish her all the best for all her upcoming projects. There will be a last Practice Class, November 15, at the EZ Loft, in Manhattan. We would like to see you there to say goodbye and take this opportunity to Practice! Unfortunate Johanna can't offer the scheduled class in October due to foot surgery and recovery time, but she'll be there in November, as she promised. Johanna is very grateful to be able to form classes, teach and learn from you, and for the opportunity of getting to know you. We hope she will return to New York and offer more courses in the future. Maybe some of you will have the opportunity of traveling to study in Germany with Johanna, or with Margarete Eller in Austria (classes are in English). The Ohashi Institute is also grateful for your participation and for studying with us. 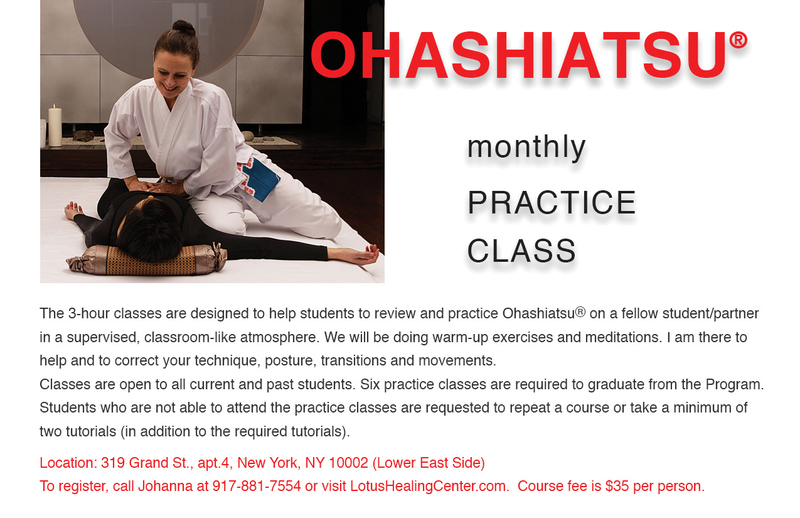 We invite you to continue your education with Ohashi when he teaches and offers sessions and tutorials at the Integral Yoga Institute on 13th Street in Manhattan. You can access his schedule at ohashi.com. If you are interested in reviewing your requirements for graduation feel free to get in contact with me and I’ll be glad to assist you. drive of the body to heal itself." Johanna Schwarzbeck and Lotus Healing are dedicated to awakening, balancing, healing, and transforming individuals and communities. Based on the principle that our experiences become our biology, she is dedicated to helping people translate their good intention into great choices. Every session with Johanna Schwarzbeck at Lotus Healing is designed to eliminate stress and maximize comfort in body mind and soul. She helps people discover their intrinsic balance and creativity in support of greater success, happiness and fulfillment in life. Please contact Johanna for a free consultation or to schedule your first session. Take the next step to transform your life. and read reviews from my clients.